make it perfect: .bbrrr, its cold. We awoke to a big frost this morning. I'm really feeling winter this year, more than I have in ages. Maybe it is because I have been more housebound than usual. 1. ~ Winter Walk, 2. Ripple Blanket, 3. my sidekick, 4. It's raining here without you, 5. Hot chocolate and polka dots: Day 114, 6. Selina Lake, 7. 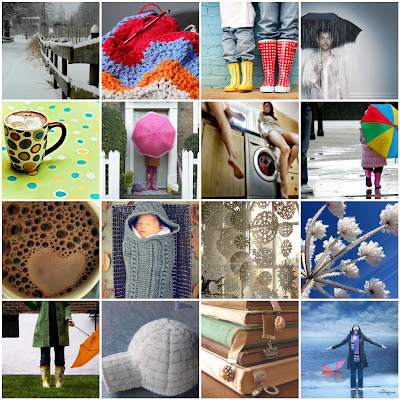 Spin cycle, 8. my beautiful umbrella, 9. hot chocolate love, 10. Untitled, 11. Snowflake Curtain, 12. White Christmas, 13. 365x3.104 • they say rain, 14. Winter Wonderland Pincushion Challenge, 15. Stack of Books, 16. `191 | The way I see it, I feel angels raining down on me. Brr... cold here too - we had a beautiful few days where I was even able to manage to get out of the house and take the kids to the local park for a little picnic. Now it is cold and raining brrr! thanks for the pics and reminding me that winter really is a beautiful time of year. I really should enjoy it and get to the snow as we will be moving north at the end of the year and I am sure to miss it.